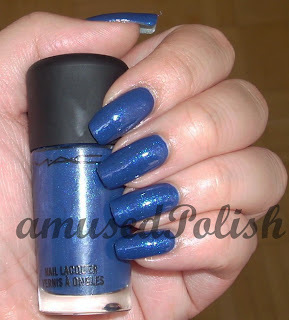 So today I've got Mac's Ming Blue for you. It was released in the Nail Trend LE in fall. 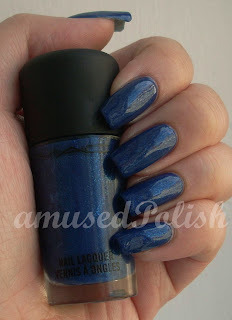 This is one of my first Mac polishes and I'm really impressed with it. I love blues and this one is right up my alley. 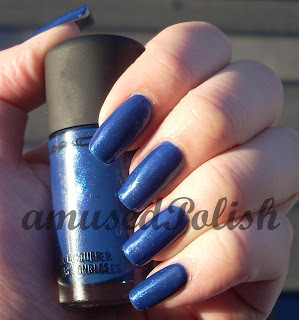 Ming Blue is a medium cobalt blue with blue and green shimmer. In the bottle the shimmer is more pronounced but on the nail it's more hidden but when the sun his it, it gets even more beautiful. I used two coats and it applied very well.